This is a Celebrity Edge cruise ship review that was sailed in November 2018. It wasn’t that long ago when all the new cruise ships being introduced were pretty much the same as the ships before them. But as the industry continues to grow exponentially, cruise lines are doing everything in their power to attract passengers – whether they are new to cruising, or simply new to the line itself. This week, Celebrity Cruises raised the bar by introducing Celebrity Edge: a ship combining groundbreaking technology, old-fashioned showmanship, and even game-changing staterooms to create a completely unique cruising experience. People love to say things like “this ain’t your grandma’s cruise ship.” Turns out, things are changing so quickly that this ain’t even your mom’s cruise ship. Celebrity Edge is packed with firsts – not the least of which, is the immediately recognizable (and much buzzed about) Magic Carpet. But there’s so much more to this ship than meets the eye. From the second you step aboard, Edge has a vibe unlike any other ship I’ve sailed on, and it continuously reveals new surprises — big and small — the more you explore. The Grand Atrium on Celebrity Edge. There’s a flow to Celebrity Edge that makes it incredibly easy to navigate. When moving from the forward section of the ship to the aft, you generally do so by walking past restaurants, shops, and other venues — including the casino — as opposed to having to cut through them. If the atrium is the beating heart of a ship, Edge’s sits on deck three… where the Martini Bar serves as a stunning anchor to a space filled with comfortable seating – perfect for meeting your party or people watching. One deck up is a coffee shop, bistro, and shopping with more seating allowing you to look down into the atrium below. Throughout the ship, the color schemes are largely muted without being dull. The overall feeling of the decor is relaxed and comfortable while still slightly upscale. Yes, the ship has some of the same staterooms you’ll find on any modern cruise ship. But the ones everyone will be talking about are the first-of-their-kind Infinite Veranda staterooms. With the push of a button, these rooms go from an oceanview cabin with floor-to-ceiling windows, to a balcony which becomes an extension of the living space. When you want access to the sea, there’s a switch by the balcony that lowers the window, and brings in that fresh sea-air. Folding doors can also partition off the sitting area and your stateroom. It’s the kind of thing that, once experienced, makes you wonder how no one ever thought if it before. It will also forever ruin traditional balconies for you because they’ll just never measure up. (It’s worth noting that just like with a traditional balcony stateroom when the door (or in this case, the window) is open, the air conditioner shuts off). The interiors of the staterooms were designed by Kelly Hoppen, who set out to make the rooms feel like an “indulgent urban apartment.” The result is a stateroom that’s spacious (23% larger than those found on the Solstice-class) and soothing, with soothing colors which seem to gently echo the ocean on which the ship sails. The rooms are also something of a technological marvel, using a smartphone app to control everything from the stateroom’s temperature to the blackout curtain that can be raised or lowered. And, for the tech-heads among us, take comfort in knowing that my stateroom had four USB plugs (two by the bed and two on the vanity), three standard plugs (one by the bed and two on the vanity), and one European plug (also on the vanity). If you needed one more additional plug, you could bring along a power converter to put into the European plug . If I had one issue, furnishings wise, it would be that the bed was definitely on the firm side. But some folks will, no doubt, like that. There’s plenty of space inside the cabin with six drawers, two spaces for hanging clothes, and a bed sitting high enough off the ground so you can stow your suitcases underneath it. The bathrooms in the Infinite Verandah stateroom have a larger-than-normal shower with a shaving bar. And yes, it’s an enclosed shower as opposed to one with a shower curtain. The amenities offered in the shower were shower gel, shampoo, and conditioner. Food is an integral part of any cruise. It’s one of the first things people either praise or complain about when posting about a cruise on social media. Tough as it may be, the best ships offer something for everyone – whether you’re a foodie with a high-developed flavor palate or someone who would be perfectly happy living on fast food. The good news here is that Edge has options for people at both ends of the spectrum. There are some really nice, high-end eateries on Edge, but none in which you’ll find unapproachable food, or feel uncomfortable about eating in if you’re not a foodie. The buffet (located on Deck 14) is called Oceanview Cafe and, as its name implies, it has a nice, open feel with some great views. It also has fairly high ceilings, which help give the space a more airy feeling than buffets sometimes have. The buffet handles crowds well thanks to about a dozen food stations, each with a different focus. Some of the popular spots were the carving station, made-to-order pasta, and a grab-and-go section featuring those kid-pleasing buffet must-haves: chicken fingers and burgers. There’s plentiful seating wrapping around the whole cafe and extending aft along the outside railing of the ship. Celebrity borrowed the dynamic dining concept from Royal Caribbean when creating this ship’s main dining rooms. In other words, gone are the traditional main dining rooms, replaced here with four themed restaurants. About 75 percent of the menu in each location is different, while the rest is comprised of items relevant to that particular restaurant’s theming. Normandie offers up French fare, Cyprus focuses on Mediterranean style dishes, Cosmopolitan is “global-inspired,” and The Tuscan serves up Italian selections. Each of these venues – as well as the Eden Cafe and Mast Grill – are complimentary. Guests can choose traditional dining (which will offer the same table and waiter each night at either 6 p.m. or 8:30 p.m.) or they can go with Celebrity Select Plus, which allows them to pick any of the four restaurants on any given night (with dining hours between 6:30 and 9:30 p.m). Those who go the traditional route receive notice in their stateroom of the restaurant they’ll be dining in, but they can request a different venue on any given night, if it is available. Tiramisu served in the Tuscan Restaurant. Specialty dining (aka for a fee) includes Le Grand Bistro (French, $25 per person), Raw on 5 (seafood, ala carte), the Rooftop Garden Grill (American BBQ, $45 per person), Fine Cut steakhouse ($55 per person), and Eden ($65 per person). Once per sailing, Le Petit Chef – a dining experience that uses 3D animation to bring the dinner table and the meal atop it to life – is offered in Le Grand Bistro at a cost of $45 per person. Of course, a popular dining spot is sure to be the Magic Carpet, where you can have lunch or dinner – both of which are a la carte for a selection of raw bar and seafood items. Two additional venues, Blu and Luminae are available only to Aquaclass and suite guests, respectively. When it comes to entertainment, you basically have to start by talking about Eden. Why? Because it’s what everyone will be buzzing about. The multi-level jungle-like area located on deck five aft is literally indescribable, as it’s unlike anything else I’ve ever experienced. It also becomes a different space entirely based on when you visit and what’s unfolding there at the time. In the mornings, it’s a great place to chill, and in the afternoons you might find people napping or taking in the views. But it is after dark that Eden blossoms, as characters who reside in its environs take you on a tour of their home. It’s discombobulating in some regards, as you have no idea what’s about to happen next. During our visit, we met Zoom and Bloom, who escorted us through the various levels that make up the space. I’ll admit that when Celebrity first began talking about this concept, I struggled to wrap my head around it. Now, having spent some time wandering around Eden, it makes sense, and yet defies description. It is like nothing you’ve ever experienced on a cruise ship, and it definitely falls into the category of something you have to see to believe – let alone grasp. 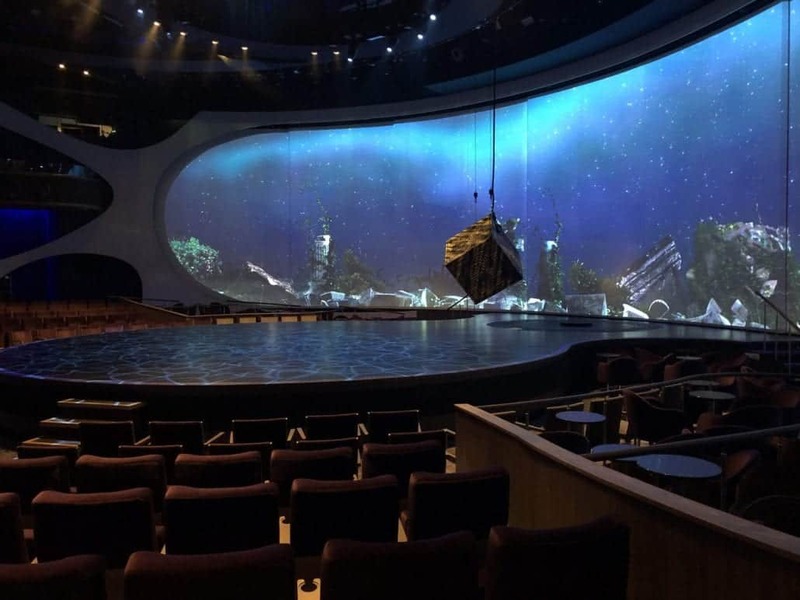 Elsewhere, there’s a beautifully-designed main show theatre. The stage actually juts out into the audience, and they’ve managed to create a space that, as far as I could tell, has great sitelines from just about every seat. There’s also an incredible sound system comprised of 154 speakers that allow sound to come at you from every direction. The space will house several shows, but the one I saw was called Hype. Described as “a musical journey” it did exactly what this kind of show should by featuring lots of musicians and singers doing their thing unhindered by a hoky plot. The second show I was able to see was more on the elaborate side. Called The Jewelry Box, it combined technology, music and wildly flexible acrobatics to create a briskly-paced spectacle that was pretty impressive on every level. Another major entertainment venue is aptly named “The Club” and, like other areas of the ship, it serves multiple purposes depending on the time of day, hosting everything from game shows to late-night dance parties. Decks three, four, and five are where you’ll find most of the spaces to grab a drink and relax. One thing you’ll notice is there are all kinds of places in which to just relax – whether sitting and pretending to read while staring at the ocean or hanging out with a group. The Rooftop Garden Grill is a particularly great space, offering fantastic views, a big-screen TV, a variety of seating configurations, and even the occasional acoustic-guitar player. Pool wise, Edge has a large one surrounded by loungers (and a few very cool hanging chairs from which you can dangle your feet into the water). There are also two hot tubs one deck above the pool which, when viewed from below, look like giant champagne glasses. Living an active lifestyle, a feature that really sticks out on Celebrity Edge is the outdoor running track. This isn’t your average cruise ship running track as this one has hills. And unlike most cruise ships that take 7 laps to make a mile, this one only takes 4.5 laps to clock in a mile. Part of the jogging track on Celebrity Edge. The casino is pretty much what you’d expect from a cruise ship casino… with one major exception: The entire space is non-smoking. Which means you don’t have to worry about the smell of smoke wafting into surrounding spaces – because it’s simply not an issue. I’m sure a lot of gamblers are going to complain about this, but the non-smokers will no doubt, be thrilled. The casino on Celebrity Edge. Time for another confession: When Celebrity began talking about the “Magic Carpet” that would hang off the side of their new ship, I thought it sounded like a ridiculous gimmick. But, as with Eden, being able to experience the Magic Carpet completely changed my mind. I’ve never seen a 90,000-ton piece of equipment (which is sort of a hyper-glorified elevator) used for so many different things. When the ship is in a tendering port, it serves as a loading dock from which you can board the boats to be shuttled ashore. (This is also where you’ll find Destination Getaway, a space that can be used to help educate passengers about the port they’re about to explore). Raised a few levels, it becomes an extension of the restaurant Raw On Five for lunch or dinner. It can also serve as a venue for live music or a bar. One thing it can’t do is take you from one level to another. This isn’t like the Rising Tide bar on Royal Caribbean ships, which travels between decks while people enjoy cocktails. The Magic Carpet never operates while people are on board, and serves its various functions only after being locked into place. If there’s one thing I look for in a cruise ship gym, it’s a view. I don’t want to watch television or the back of someone’s head… I want to get on the treadmill and work up a sweat while staring out into the ocean. Because Celebrity Edge’s workout facilities are located at the front of the ship, you wind up having amazing views while burning off the calories. The thermal spa has eight different “spaces”, most of which are very modern takes on a familiar concept. For example, the sauna uses infrared heat – offering all the benefits of the sun with none of the damaging UV rays. Perhaps the coolest space in the spa is the “float room” in which hanging chairs gently sway as you take in amazing views of the ocean. Everything about the spa is designed to soothe and relax. There’s also, of course, a full set of services and treatments you can purchase, as well as a full salon and barber shop. Thermal chairs on Celebrity Edge. From the moment Celebrity Edge was announced, it had people talking. Now, after getting a chance to explore the ship, I can say that the Edge definitely lives up to its hype.